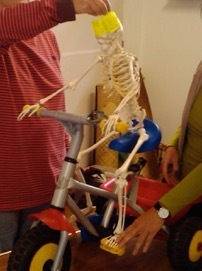 Hi folks, here am I on my fantastic tricycle, being useful as usual and helping out with other hands at the cycle-technique workshop we ran in June. It was great, we had a willing but wobbly day and another for the experienced but aching, both liked my contribution to the workshops and the fact I used let my sitbones to support me on the saddle. There are more workshops in September .... maybe see you there.